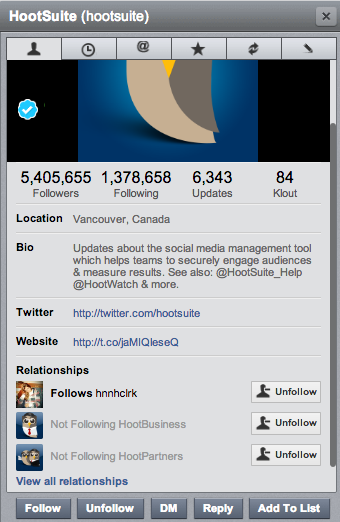 HootSuite wouldn’t be where it is today without our community of users. To stay on top of what our community needs, our Product team keeps a close eye on our Feedback Forum, where users are invited to suggest and vote on features they want to see. During our recent 2-day Hackathon, one of our teams made it their goal to build the Feedback forum’s most-requested dashboard additions. Over the course of 48-hours they suggested workflows, coded and tested, dark-launched several products, and demo’d their finished products to a scrutinizing audience of 200 other HootSuite employees. Another one of these features is ready for you to start using right away. What is the key to social media? The answer is simple, being social. 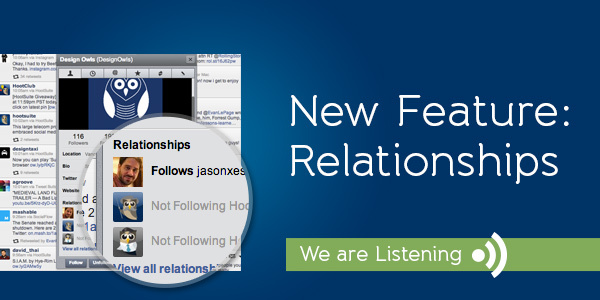 Now we are combining the People Following Me and People I Follow tabs in your HootSuite Dashboard, and have come up with Relationships. To see who is following you, just click on a user profile and scroll to the bottom. Here you will be able to see if this account is following you, as well as if you are following them. You also have the option to follow or unfollow a user in this area by simply clicking the Follow/Unfollow buttons. Want to see who is following you? Maybe you want to check out who you are following? Now both are easy to do with the new Relationships feature. Stay social in your online presence and jump into your HootSuite dashboard to try this new feature. This is Part Two of the We Are Listening series, make sure to take a look at the Part One: Retweet Visability. We’ll be releasing more features over the course of the next several weeks, and we want you to tell us what you think. Got feedback on this feature? Let us know in the comments. Got an idea for us? Write in or vote in our User Feedback Forum. Your ideas help drive our innovation.